If you’re working remotely or traveling over the holidays, then you should be extra careful this season when it comes to cyber scams. Clutch recently revealed that 64% of employees use a business-approved device for job-related tasks. However, only 40% of the personal devices utilized are monitored. 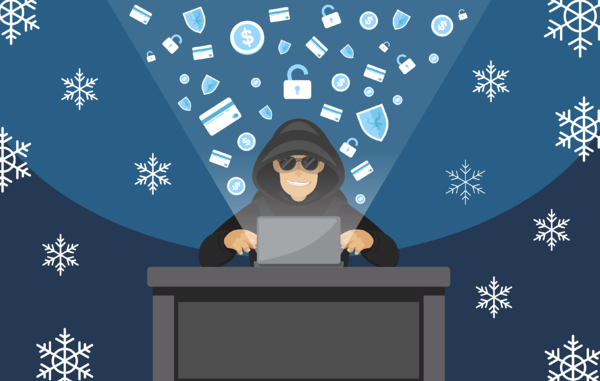 With cybercriminals targeting holiday shoppers this season, employers should be concerned. Just because the holidays are coming up doesn’t mean cyber hackers are playing nice this season. Stay alert for scams and suspicious cues while scanning your inbox for shopping deals and holiday e-cards. Follow your regular security protocols for phishing tactics and don’t click on any links or attachments without inspecting the email content beforehand. Jaw-dropping discounts on products can be too good to be true. What might seem like a significant markdown on a Le Creuset kitchen set your mother always wanted, could very well be a scam. Don’t be fooled by unknown retailers and fake websites that trick consumers into giving their personal information to a hacker. What you thought was “an amazing deal” can end up costing you unusual bank withdrawals from cyber criminals that have obtained your account information. If you’re traveling for the holidays and taking your devices along with you, back up your files on an external hard drive and/or a cloud source. If you lose or damage any device while you’re away, you want to make sure you can recover your files later on. If there are sensitive documents that you don’t need to bring along with you, then don’t bring it on that device. Keep your holiday vacation stress to a minimum and travel light without documents that can cost you or your business damage from a data breach. Locking down your devices and accounts with strong passwords and pins is a necessary security measure to prevent your device’s content from being accessed by a hacker. For an additional line of protection, activate double-authentication to get notified when your accounts are being accessed from unknown sources. This extra layer of security also requires identification in the form of a fingerprint, SMS text, alternate email or secondary passcode. Always take caution when connecting to public WiFi hotspots, even when the network seems safe. On shared public networks, hackers can get access to your usernames and passwords, so you will want to limit your activity. Don’t access your bank accounts, make online reservations or purchase items while you’re connected. This activity can make your financial information trackable for hackers also in the same network. Ensure all of your devices are up-to-date with the latest operating systems and security updates. Out of date systems can contain vulnerabilities for hackers to break in. Turning on automatic system updates for your device and browser will help block off the gaps allowing hackers to plot their attacks. Infecting public USB ports are a common travel hacking trend called "juice jacking." To avoid getting hacked, always use an AC power brick when in public locations. Hackers install malware through public ports in airports, train stations, hotels and other open spaces so be sure to never plug your USB cable directly into those sources. To learn more about cybersecurity awareness for best practices and phishing tactics, check out our article here. For more information about our comprehensive cybersecurity services, contact us here or email cyber@align.com.